Miniature Zebu differs from other small cattle in that they are a natural breed. They are not just bred to be tinier and tinier each generation or aren’t just the results of a breeding-gone-bad. This breed is actually one of the oldest known cattle breeds, dating back to 6000 BC. They are believed to have originated in Southern India. A few of these were imported in the 1920’s for zoological gardens in this country and from there the breed has flourished in the United States. Aside from their size, one of the distinguishing characteristics is a well-developed hump, especially on the mature bull. They have the Brahman look except a miniature zebu’s ears are erect rather than pendulous. Both bulls and cows have horns of moderate size. 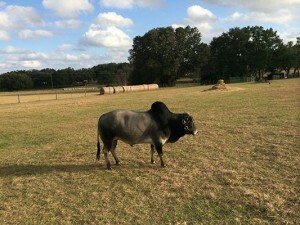 In comparison to conventional breeds of cattle, Miniature Zebu are slow to mature. It appears that the smaller the animal, the older they are when they first breed. It is normal for a heifer to give birth to her first calf around 30 to 36 months of age. Miniature Zebu are a hearty, disease resistant breed of cattle. This is a tropical breed that loves hot weather and will lie in full sun on the hottest days of the year. On windy or cold days they prefer to spend their time inside a shelter. As long as you furnish them with the proper housing in the winter months, they will do fine. Miniature Zebu are much easier on the land, pasture, fencing and equipment and are considerably safer for children to be around. They are also easier and safer to confine for veterinarian care. Expensive fencing and heavy-duty equipment are not needed. 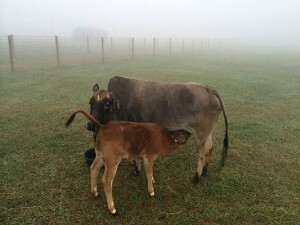 A Miniature Zebu breeder has up to six different markets for their newborn calves: pets, beef, breeding animals, mini milkers, junior rodeo stock, and show cattle. About 70% of the Miniature Zebu sold today are being sold as pets. Many of the professional couples that are moving out of the cities and occupying those 3 to 5 acre mini ranchettes are looking for four legged lawn mowers. You do not own Miniature Zebus, they own you. Some of the other characteristics promoted by breeders are that this breed has a long life span, living 20 plus years with good care. They are intelligent, resistant to flies due to their very active sub-dermal (under the skin) twitching muscles. They have functional sweat glands that aid in cooling which makes them more heat tolerant. 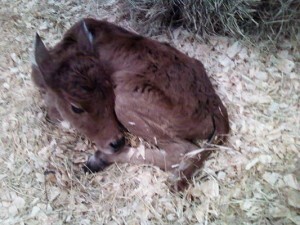 If you have never seen a newborn Miniature Zebu calf, you don’t know what you are missing. They are so extremely petite, almost fawn like. Newborn calves are 16 to 18 inches tall and weigh 18 to 22 pounds. 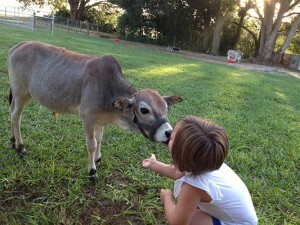 The bottom line is we raise Miniature Zebu cattle because we love them, not just to make a profit. Purchase animals that you like and want to have, not for the purpose of just making money.